Dave Kindig and his crew in his Salt Lake City shop builds and restores classic vehicles from a '33 Ford Tudor to a '69 Camaro. It doesn't matter whether it's a busted out bike or a rusted out roadster, Joe Martin and his crew are hard at work giving vehicles another chance in life. As a former test pilot, Dan Short hopes that FantomWorks will become a classic car restoration shop that runs with military precision. Instead, he is finding out that when making old cars 'better than new' - nothing goes according to plan. People trick unsuspecting car owners into thinking their car was towed and instead fix them up. 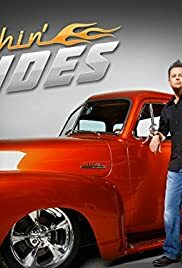 With all the overly dramatic reality shows it's refreshing to watch something that actually captures your interest, shows cars being restored as well as the difficulties, mistakes, fabrication and painting. I love that they show the whole process including manufacturing upholstery which is really interesting. And they don't create unnecessary drama to try and enhance the show, a nice change. I also noticed that they will attempt anything and have no bias towards a particular car manufacturer although the individual workers do and that's ok.
Dave's colour palette continually impresses and at times I would never think to put colours together that he does but they always work and work well. Dave has a great presence, quiet, dry humour and can take a joke as well. He treats his staff very well and is a great boss. Every staff member seems to take great pride in their work and they produce truly inspiring vehicles. However, they need to dial back the scripted banter, it looks and sounds unnatural. The humour is fun but at times feels a little forced and goes on a little long, everyone wants to be a comedian. Thankfully Dave reigns it in before it becomes annoying. At times the show feels a little saccharin and they need to make sure the intention of the show is it's primary goal. Kevdog is the Workshop Manager and if he is that knowledgeable he needs to step up. I don't see much evidence of his knowledge, management or organisational abilities. He acts like the class clown that everyone tolerates, this needs fixing. Interestingly enough a number of cars that they work on appear for sale on their website. Yet when they complete the cars the owners just about cry and overly enthuse on how much they love the car. If so, why is it up for sale? Curious. Overall this is a solid 8 for the detail they show and the likeability of the cast without overdoing it.